|Sometimes the Frog shows up in unexpected places - on your bag, your socks, maybe even your belt buckle. Our accessories will add the perfect finishing touch to any outfit. Free shipping with total purchases greater than $100. Don't worry: the Frog guarantees our stuff 100%. 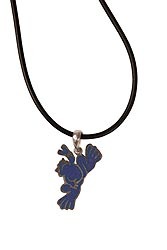 And your purchase helps Peace Frogs support charities like the National Wildlife Federation and The Organization of Tropical Studies.